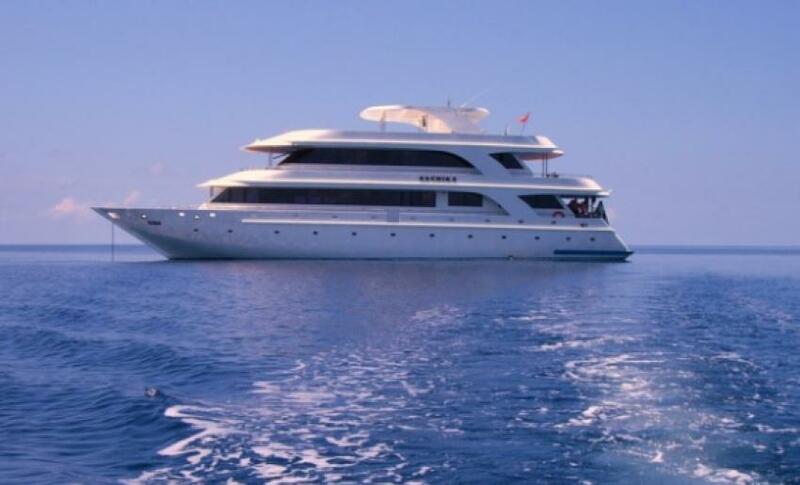 Sachika is a luxury wooden yacht that provides you with the opportunity to discover amazing Maldives Atolls. Sachika has 10 cabins on board. There are 2 standard rooms with twin beds, that can be shared as well as 4 standard double twin rooms. This cabins can be also used for double accommodation. On the lower deck also 1 junior suite with double bed is placed. Three suites are on the upper deck. This type of staterooms has big windows with a gorgeous view, monitors, and players. All rooms are ensuite and have air conditioner system. In between dives boats passengers can stay in the lounge area that contains coffee corner, restaurant area and a bar with panoramic windows. Salon equipped with an entertainment system. It suited to relax after diving, chat with other divers on board or watch TV. To enjoy the sun and watch the marine scenery Sachika guests can stay on the sun deck. It has several sun beds and a jacuzzi for more relaxation. Besides diving and other activities, Sachika can offer you massage in a privacy of massage room. Get deeper relaxation and restore your energy. Boats massage therapies designed according to the personal needs. Sachika has two dhonies made for convenient diving. They carry all diving equipment. These boats are spacious and divers can prepare equipment and themselves for diving there. Dhonies featured with aluminium and steel tanks and air compressors. Diving equipment can be rent on board if booked in advance. Itinerary of Sachika includes the top destinations of Maldives. Divers will visit North and South Male Atolls, Rasdhoo, Meemu and Ari Atolls. While diving you can meet many amazing creatures, such as reef sharks, mantas, and napoleon wrasses. Reefs and walls of Maldivian atolls are covered with numerous of colorful corals. Ari atolls are slightly differs from others. Corals are stretching in barrier reefs wich makes currents stronger. This destination attracts many of manta rays. Huge whale sharks can be spotted as well. Maldives are best to visit from November to May. Although diving season lasts all year round.